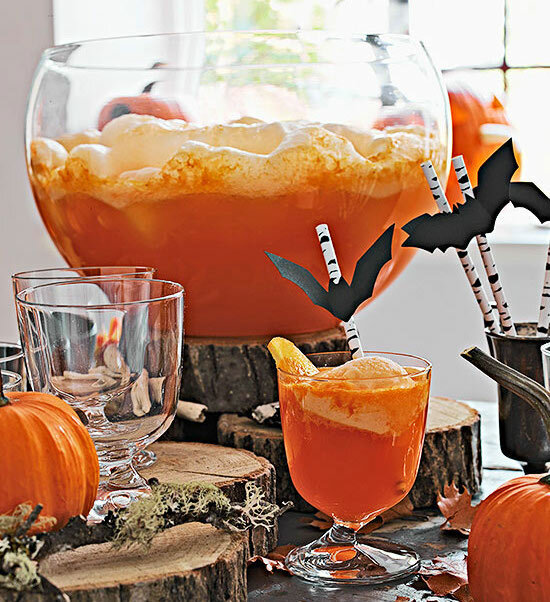 No goblin or ghoul will go thirsty at your Halloween party with these delightful party drinks and punch recipes. Concoct a kid-friendly beverage, or experiment with adults-only cocktail creations. This is a sweet drink that’s sure to be enjoyed by kids and adults alike. 2. To serve, combine orange juice concentrate, ginger ale, and seltzer in a punch bowl. Top with scoops of the sherbet and orange slices. Prosecco, orange liqueur, pomegranate juice, and ginger combine for a delightful and refreshing Halloween party drink that’s creepy only in color. Garnish with grapefruit slices and fresh rosemary for a flavorful and pretty touch. Don’t leave the kids out at your next Halloween soiree. 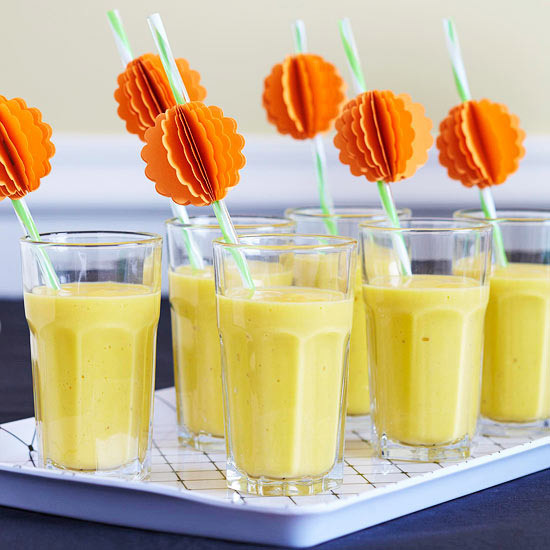 On a night all about sugar, sneak in these healthy banana-mango smoothies for a sweet treat that you can feel good about. Top off the delicious juice with a festive pumpkin straw to keep with the holiday. Using double-stick tape, attach the straw close to the staple, leaving a green stem peeking out above the paper pumpkin. 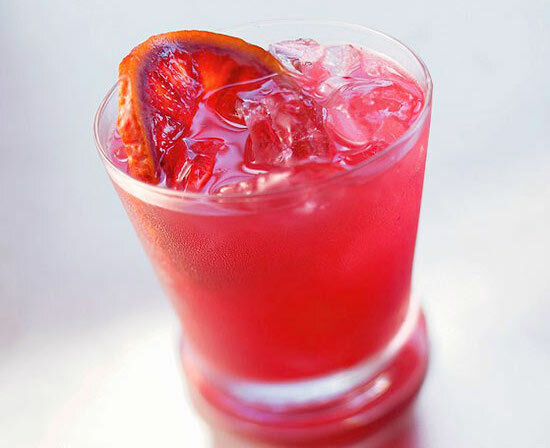 For frighteningly delicious drink, try this blood orange cocktail. A short ingredient list means it’s easy to whip up, and the natural coloring of blood oranges make it on-theme for Halloween. It’s sophistication with only a tiny touch of scary. This monstrously flavorful slush is just dripping with spooky character. 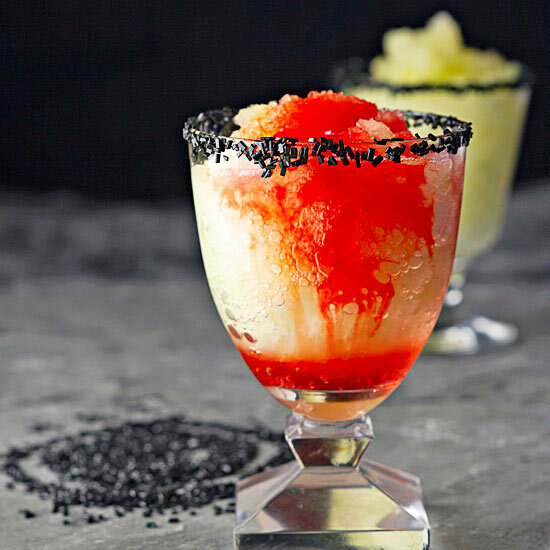 The tequila-laced frozen mixture of melon and orange takes on the look of a mad scientist’s latest experiment when it’s doused in bubbling lemon-lime soft drink and drizzled with bloodred grenadine. Black decorating sugar rims the glass with ominous effect. White chocolate apparitions haunt this chilling beverage. 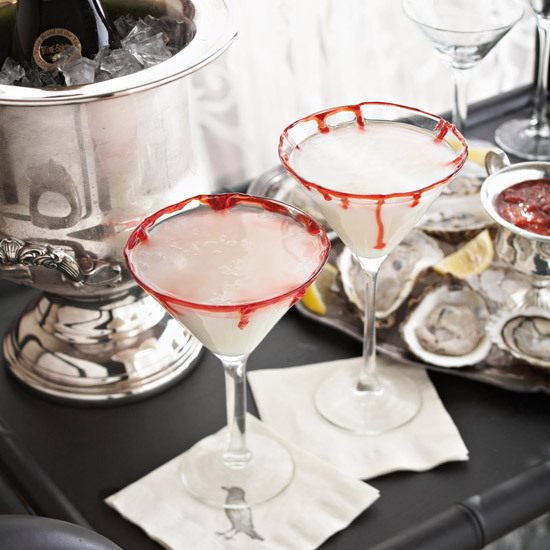 The spirited adults-only potion is shaken with ice to blend the vodka, white chocolate liqueur, milk, and whipping cream. 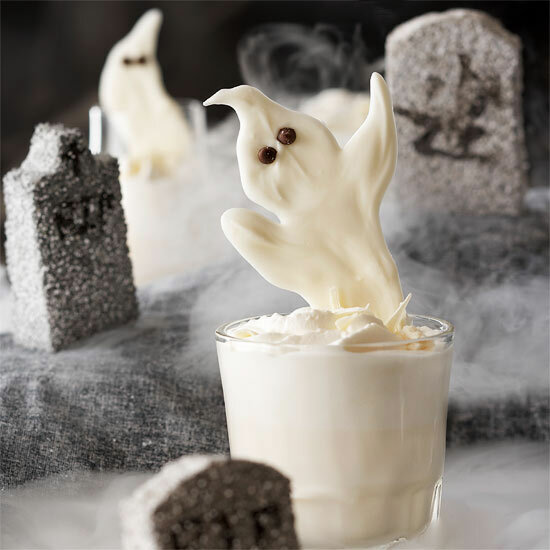 Topped with a spritz of whipped cream and the ghostly garnish, the taste will haunt your party guests’ dreams. This creepy cocktail shimmers with the color of blood. 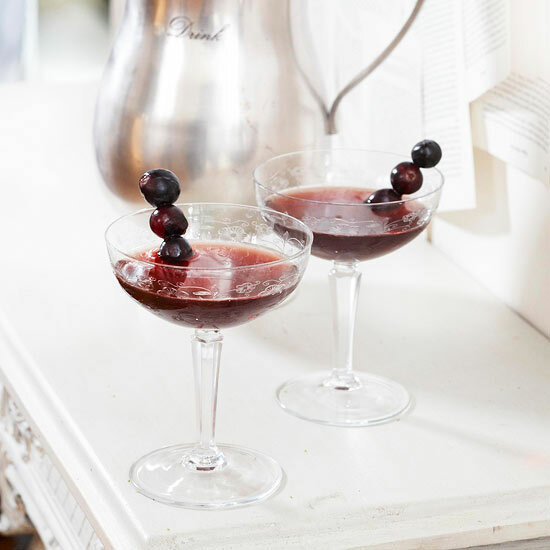 Bold flavors — maple, Concord grape juice, and whiskey — infuse this rich and flavorful drink. Serve the cocktail in old-style Champagne glasses garnished with skewered grapes for a beverage that will delight all the vampires on your Halloween-party guest list. 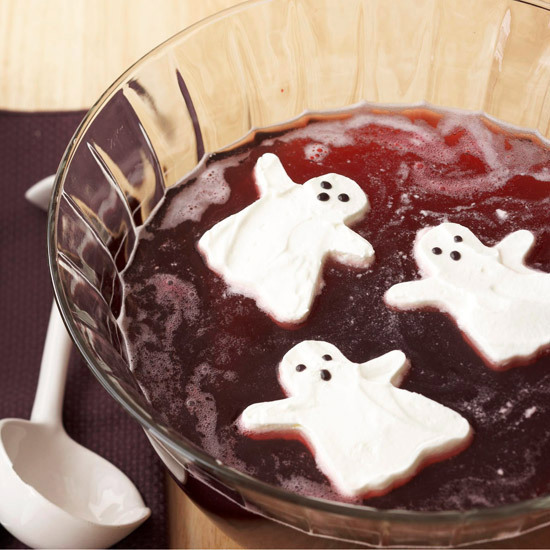 This bubbly punch with creamy ghost ice cubes tastes delicious and looks great on a Halloween beverage table. Ghouls and goblins alike will love the fruity flavors. 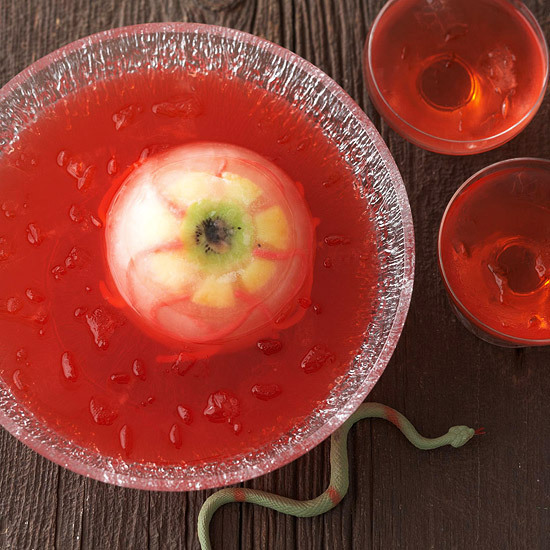 Guests will feel like they’re being watched when helping themselves to a glass of this punch — a creepy eyeball ice ring floats inside. 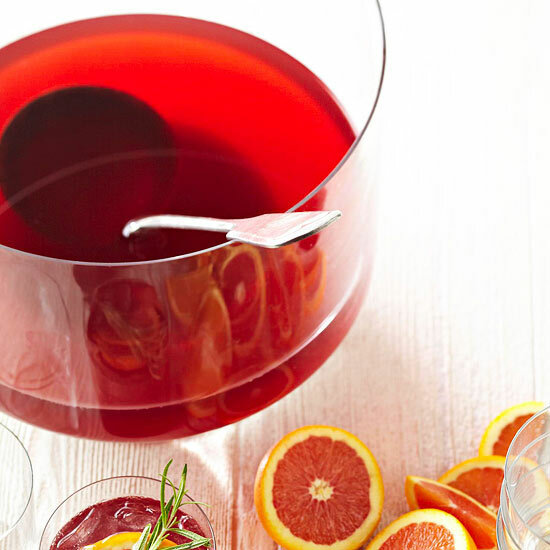 But with fruity ingredients, the eye will add a chill — and flavor — to your Halloween punch. 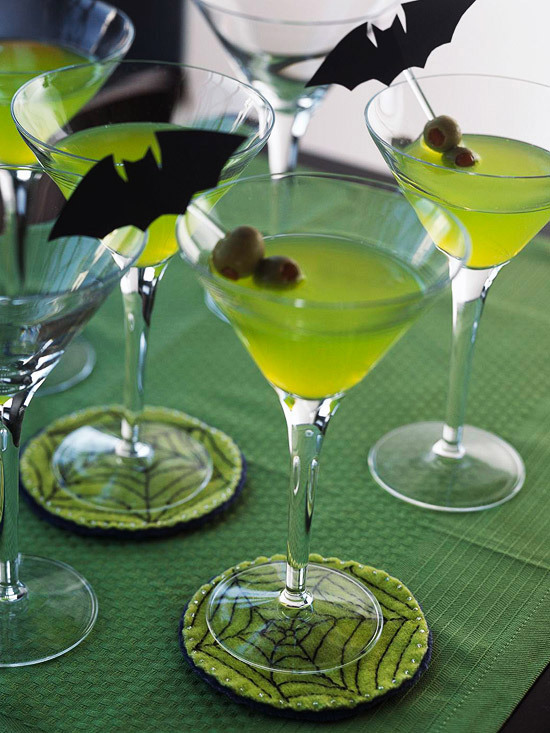 Green lemonade is both refreshing and wickedly appropriate for the Halloween holiday. Give an adult edge to these ghoulish drinks by adding vodka. Startle your Halloween guests with this wicked brew. White chocolate, coconut, cream, rum, and vodka make a tasty martini, while red cake gel around the rim adds just the right amount of fright. For younger goblins, substitute lemonade or lemon-lime soda.